Leigh Brill's story of her life with her service dog, Slugger, will inspire you, and break your heart, as so many animal stories do. But, don't hesitate to read A Dog Named Slugger. The story of this relationship needs to be told. Leigh Brill has cerebral palsy. Her childhood was spent suffering through surgeries, embarrassment, and hearing herself called "a cripple" as she fell. And, her cerebral palsy was the greatest secret of her childhood. It wasn't discussed, and she tried to hide it even through college, trying to appear normal. But, in 1992, while a grad student, her feet hurt; she fell, was late to class, and realized she needed help. At the right moment, a classmate showed up with her service dog, demonstrating how a dog could help someone with a disability. Given a flyer about Caring Canine Companions, Brill began hoping for a service dog of her own. Enter Slugger, a yellow Labrador. For two years, Slugger had trained to be a companion. And, he was the perfect dog for Leigh. He was trained to carry her belongings, retrieve them when she dropped them, fetch her telephone, and open heavy doors. Brill's own training with Slugger took time, and she tells of working with him as they learned to trust each other. When they passed the certification test, they passed on to another stage of life. Slugger's assistance enabled Leigh Brill to become more confident in herself. With Slugger by her side, she found friendship and relationships. But, it was that relationship with Slugger that inspired love and devotion on both sides. A Dog Named Slugger is an education and an inspiration. Leigh Brill now has the confidence to reveal her own fears and weaknesses in this book, while she shows how a service dog can change a person's life. Slugger changed Leigh Brill's whole world. 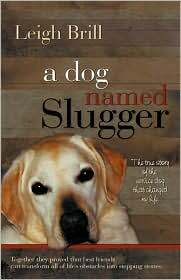 A Dog Named Slugger is a story of the power of love, and a dog. A Dog Named Slugger: The True Story of the Service Dog That Changed My Life by Leigh Brill. BelleBooks, ©2010. ISBN 9780984325658 (paperback), 248p. Oh, gosh, I'm crying already and I haven't even read one page of this book. What a huge difference Slugger must have made in Leigh Brill's life. Thanks for telling us about this book. You're welcome, kathy. Slugger made a world of difference to Leigh's life, and through Leigh, to other lives as well. I live near a former Lighthouse building which is now a Vision Center. There are many visually-disabled people who go there, most without guide dogs. I helped two people cross avenues to get there last week. One talked lovingly about her guide dog, but not longer has one. I wished that both of those people had guide dogs, to help them, for companionship and affection. It would help. A friend had his guide dog, Hooper, for years until Hooper got too old. He was a terrifically loyal dog, but so friendly to his friends, wanted to play, chase a frisbe, play tag and swipe our snacks. And my friend was bereft after Hooper retired. Anyway, another Ode to Dogs. The above comment was from Kathy D.
One of our neighbors had a service dog because of his Parkinson's disease. That dog is wonderful. He came to our door for help one time when Joel fell. Joel passed away recently and the dog is still in mourning. This book sounds wonderful. Dogs are so amazing. I think service dogs are just wonderful. A friend once trained one who just didn't make it. The dog had hip problems. But, when it gives a person so much independence and confidence, it's wonderful. I'll take an Ode to Dogs any day. Dogs are amazing, Lisa. It's truly an inspiring book. On cats, a slight diversion here, see photos posted up at Eurocrime website of Karen Meeks' brood. Thanks, Anonymous. Always willing to look at cats. Sorry for my hitting the wrong keys, I guess that is what's happening. I'm sorry. I'm having a tired day. Those were both from Kathy D.
No problem. I'll take the comments, no matter what keys you're hitting. This sounds wonderful. I once had the privilege of having lunch with some people from the Canine Companions for Independence organization. Listening to them talk about the difference these service dogs make in the lives of the humans they're assigned to was absolutely incredible. I can't wait to read this book. I thought of you while I was reading the book, and reviewing it. I thought it would be right up your alley. And, check back on Thursday if you haven't read Helen Brown's Cleo. I think it's another book meant for you. Also, think of how the people must feel who train these service dogs, as well as dogs for people who are visually disabled. Although they must miss the dogs terribly when they have to let them move on to do their jobs, they must feel such incredible feelings of accomplishment for being able to help people in such a meaningful way. There is so much to say in favor of that task. And for young people who do this, it must be rewarding and good for them in many ways. Wish there were more programs that do this. You're right, kathy. I think you have to be a very special person to train those dogs, let them into your heart, and then send them on to a purposeful life with someone who needs them. I'm sure it's rewarding.